"Russia's Evolving Relations with East Asia"
(We accept pre-registration until 10:00a.m. 14th, October. The pre-registraion is now closed. Please register on the reception at Room 710. "Where in East Asia Is Russia?" "Where Is Russia Heading, Asia, Europe, Or Somewhere Else?" 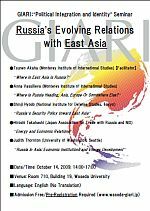 "Russia's Security Policy toward East Asia"
"New Development of Japan-Russia Economic Relations"
"Russia in Asia; Economic Institutions and Energy Development"